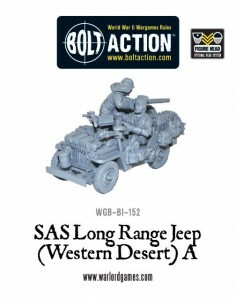 Warlord Games has new SAS long-range Jeeps available for Bolt Action. Now for something a bit special – Special Air Service to be precise! We’ve had our resin Willys Jeeps converted by Warlord’s own Darek Wyrozebski to make these SAS Jeeps that raided behind the Axis lines. Cluttered with all manner of kit and the essential jerry cans full of water or fuel, these are superbly detailed representations of the vehicles SAS founder David Stirling’s lads used to such great affect in the campaign in the Western Desert.